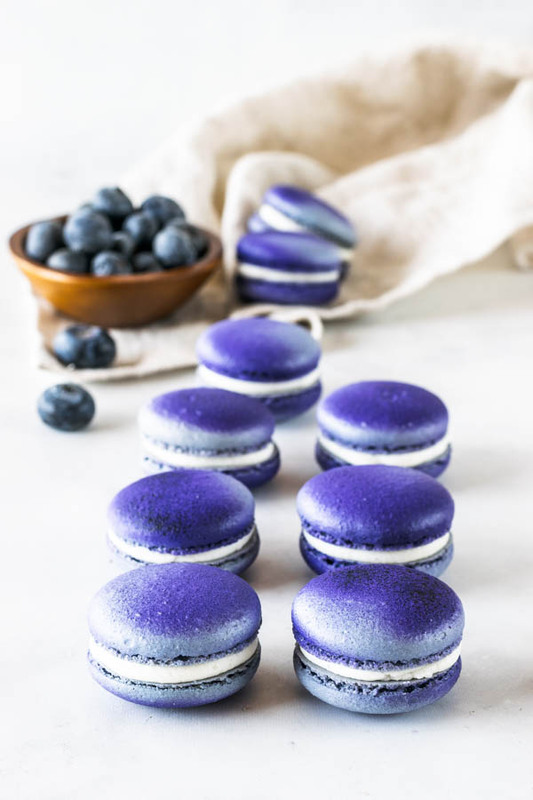 Yes, I already have a Blueberry Macaron recipe on my blog. 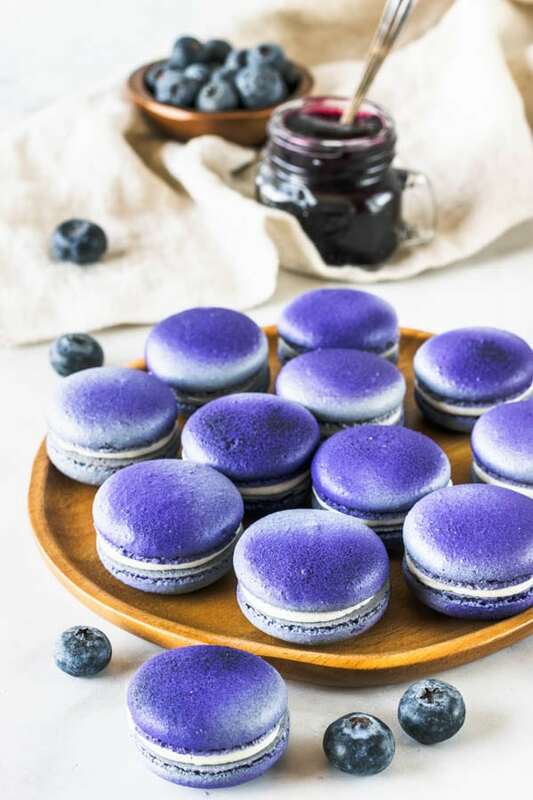 But today I present to you its sibling: Blueberry Macarons with jam filling. 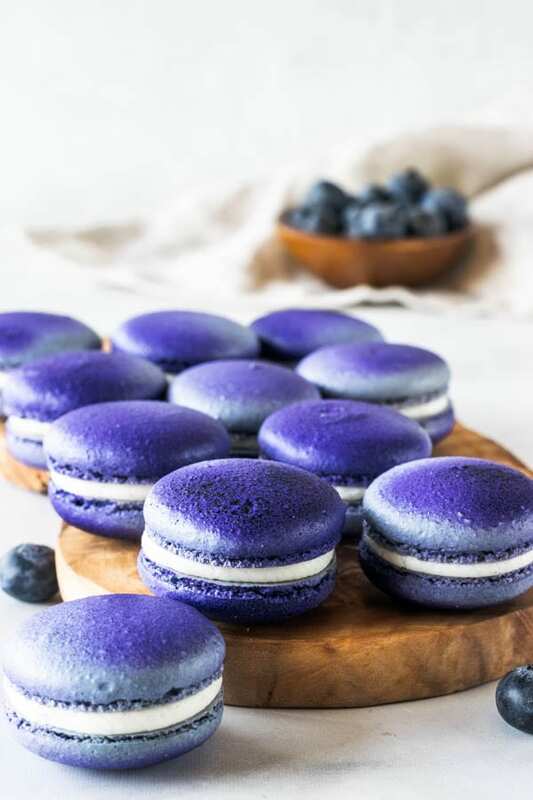 You see, my first recipe for Blueberry Macarons had a mascarpone filling. It actually involved a blueberry jam mixed into the mascarpone and powdered sugar, and that’s a huge favorite til this day. I just had someone on Instagram a couple hours ago make it and tag me in it. By the way, if you make any of my macaron recipes, I would love to see it on instagram. Just tag me @piesandtacos, please! It makes me so happy to see what you are all creating and how your macaron journey is evolving. 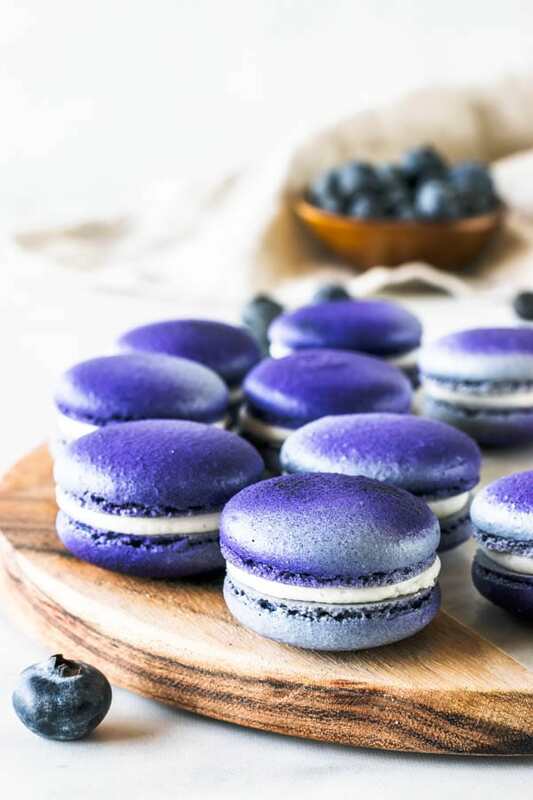 Anyway, yes, my previous Blueberry Macarons recipe was great and fantastic. But I really really love macarons with jam filling. So I needed to create another recipe. Plus, I was dying to use my airbrush pen. And purple seemed like the perfect color to do so. Yes, the beautiful effect on the shells is an airbrush pen. I use this kit by Cake Boss. I’ve used it only a couple of other times. But I really love it, and I am looking for other ways to use it. I used it on my Pumpkin Macarons I made last fall. How freaking gorgeous is that effect though!! I am in love. 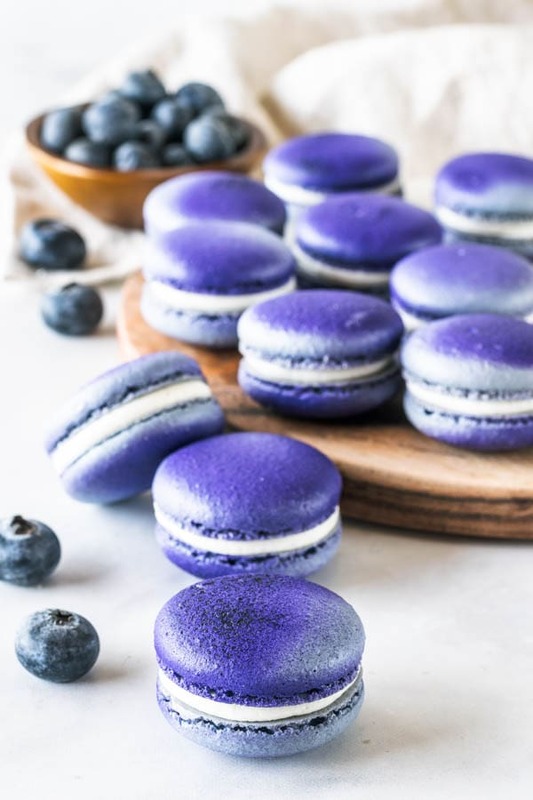 Anyway, I am just loving all blueberry flavors at the moment (wait for some more blueberry recipes coming your way). My macbook broke last week, and I went almost a whole week without a computer, which may not seem like much, but is a lot for a food blogger who is eager to edit pictures and post recipes on her blog. Thankfully I was able to get a new computer and now I am back to work, editing all the pictures I’ve taken those lonely days without my macbook, and now I am writing the recipes to publish here, which takes a bit of time, but again, doesn’t feel like work when you love what you do, does it? And that’s the reality, people. I absolutely love being a food blogger. And I am so thankful that so many of you love making my recipes. Specially my macarons, which became super popular. 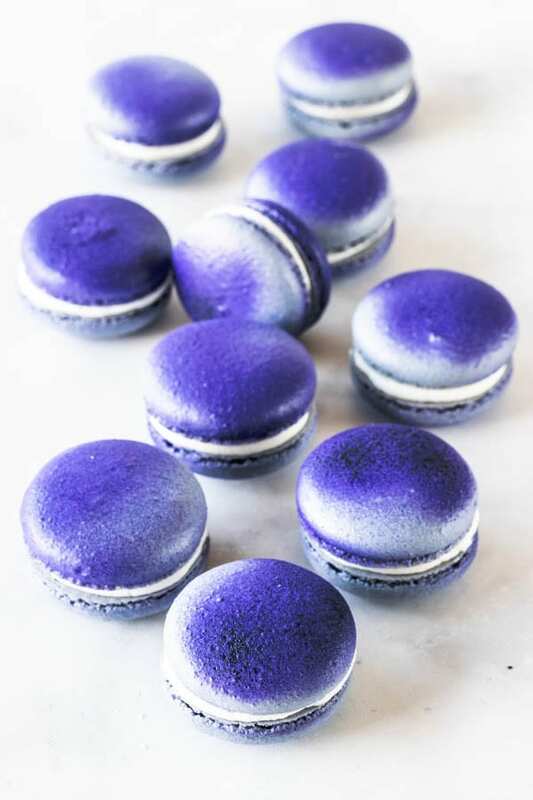 Every time I get a message from someone saying they finally mastered macarons, I get super happy and accomplished, because I try my best to explain my method in detail. 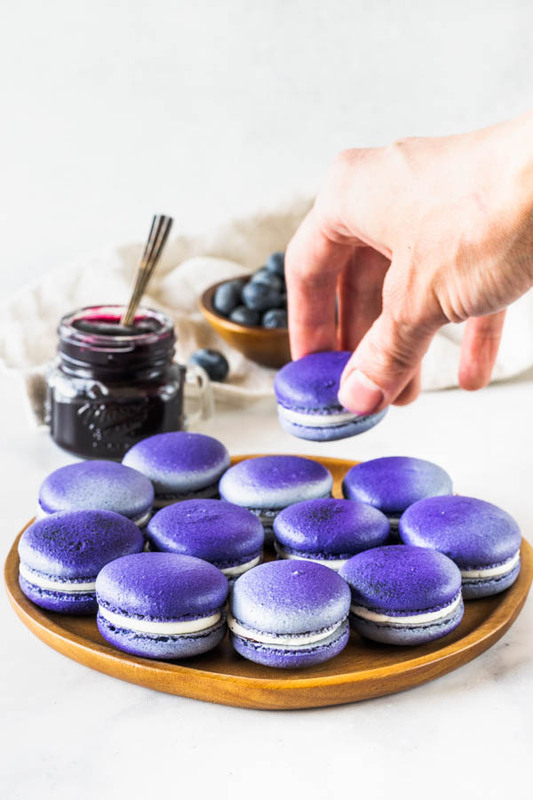 Which is why I am writing a macaron eBook, which you probably know if you read my macaron posts, because I’ve been talking about it on my last macaron posts. I have a tone of Macaron posts for you to check out, by the way. 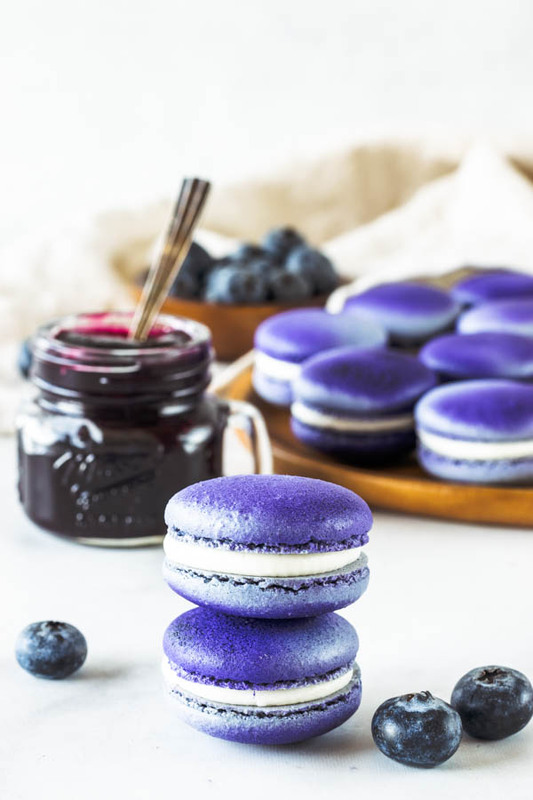 Click HERE to check out some more macaron recipes and ideas. I am totally devoted to helping people figure out how to master this special little cookie. It is a special cookie, because it takes a whole lot of love to master it. Love for baking, love for sharing, love for eating it also. On my Macaron posts on my blog, you can find tones of tips on how to make macarons, store them, types of flour to use, and more. 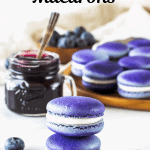 And since these tips are kind of all spread all over my many macaron recipe posts, I am working very hard on getting this eBook out soon, so all tips are compiled in the same place. 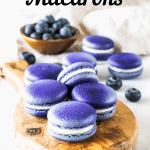 This way, my Macaron eBook can be a source for you to refer to anytime you are making macarons, or even when you encounter an issue with a macaron batch. 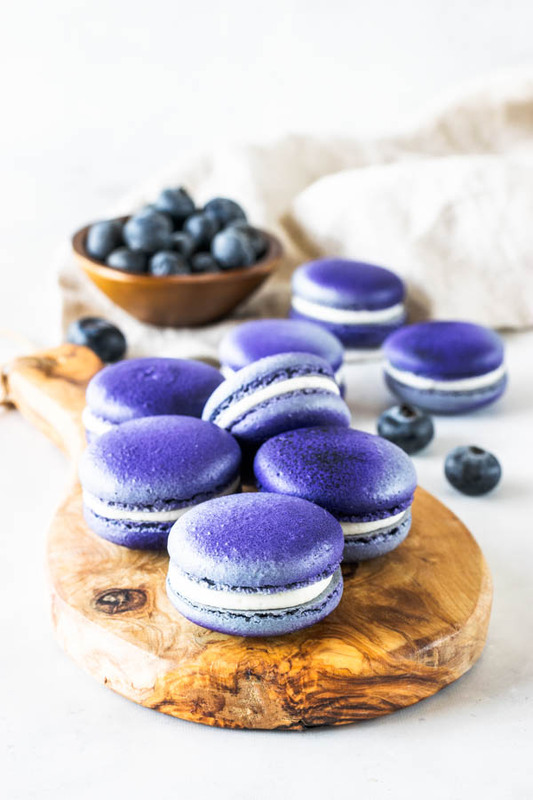 And, of course, don’t forget to check out my first Blueberry Macarons recipe. If you are new to making macarons and can’t wait for my Macaron eBook to come out, check out my Matcha Macarons post, where I go over some main tips and techniques. 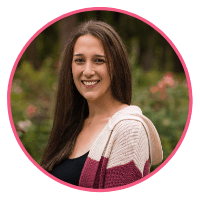 On my Raspberry Macarons post, I talk about Almond Flour, brands, sifting methods, etc. On my Espresso Macarons post, I answer common questions about making macarons. On my Lemon Macarons post, I talk about macaron shelf life and storage. Check them out! I have tones of other tips all throughout my many macaron recipes. And also, there are tones of other resources online that can help you. 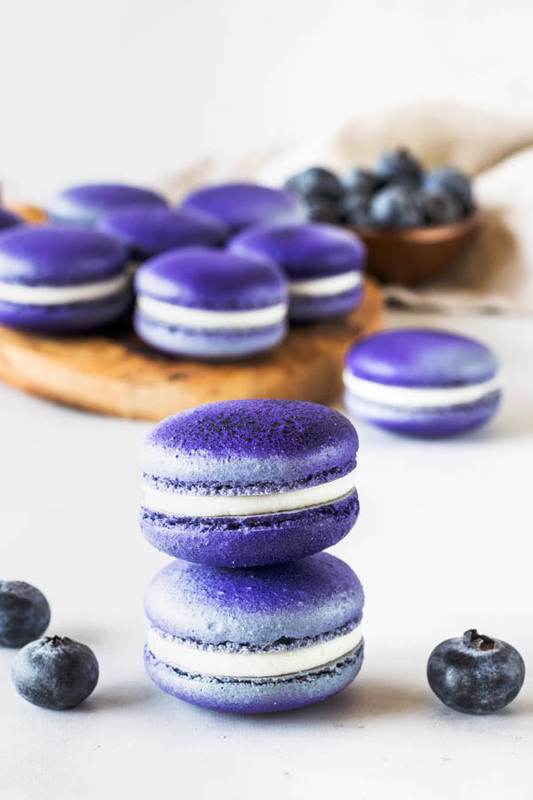 Thank you so much for coming to my blog, checking out my recipes, I really appreciate all the support from this amazing tribe of macaron bakers out there! 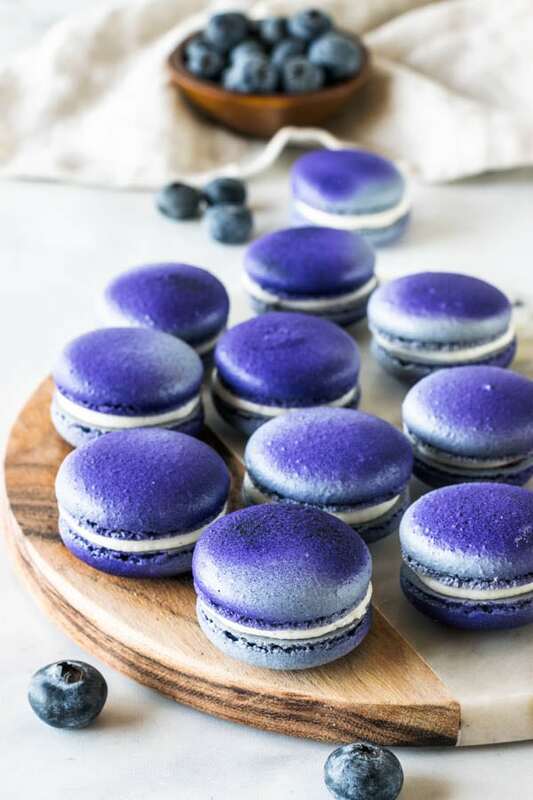 Check down below some of the materials I use to make my macarons, that make the process a bit smoother. Thank you again for coming by. Have a great one! 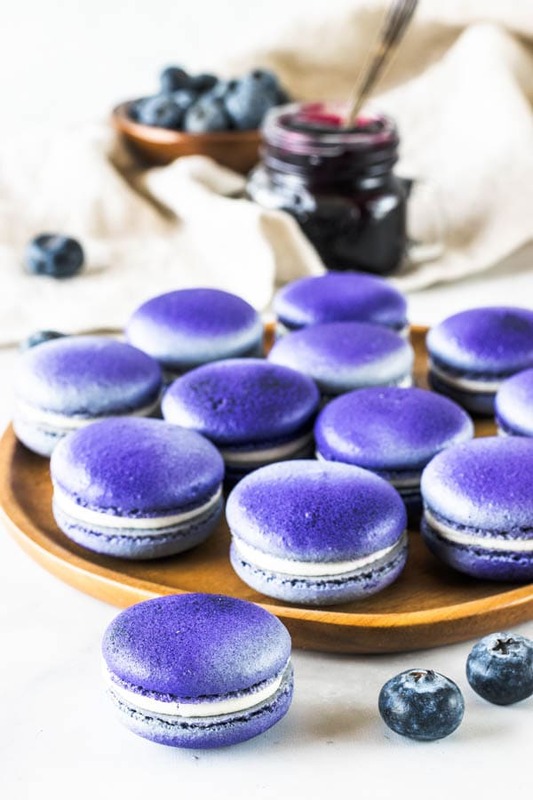 Blueberry Macarons filled with blueberry jam. I used an air brush pen to obtain the beautiful effect on the shells. Start folding gently forming a letter J with a spatula. Add the food coloring at this point, if using. Mix blueberries, maple syrup (or sweetener) and lemon juice in a small pot. Bring to a boil over medium heat, cook, stirring, for about 5 minutes. Use the spoon to break up the blueberries as you stir. Once blueberries have boiled and reduced a bit, add cornstarch and water to the pan. You may process the jam in a small food processor to make it smooth if you want to, or strain it. I like my blueberry jam to be a bit chunky, so I usually leave it as is, though sometimes I do process it on my blender cup to make it smooth. Cream butter at medium speed in the bowl of an electric mixer for about 1 minute. With the mixer off, add all of the powdered sugar in. On low speed, beat the sugar and butter together. Once they are incorporated, turn speed to medium and cream for 1-2 minutes until very fluffy. Add vanilla extract and beat for another 30-45 seconds. If buttercream is too stiff, add a bit of milk or water to make it a bit softer. And if buttercream is too runny, add a bit more sifted powdered sugar. Pipe a circle of buttercream around the edges of the macaron, in a way that you have a little hole in the middle. Fill the little hole with a bit of blueberry jam. Don’t overfill it. Place another shell on top. 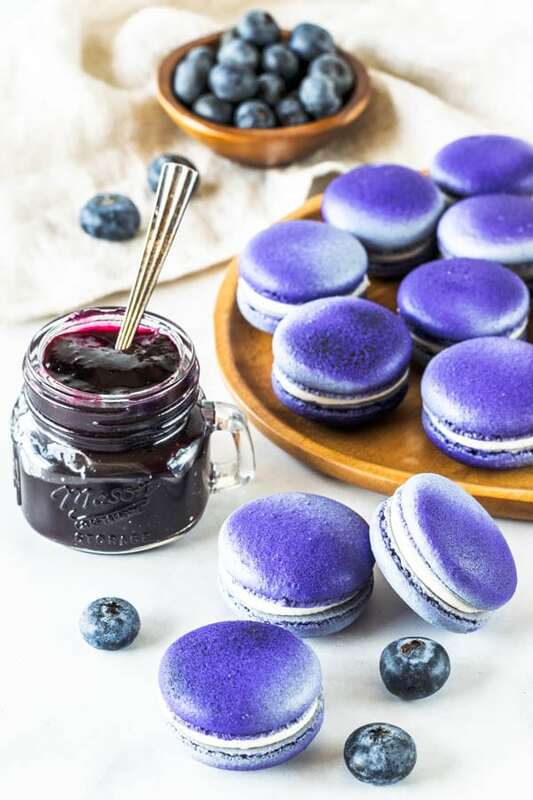 I don’t recommend freezing macarons with jam fillings, since they will often turn soggy because of the jam. If you don’t want to make your own jam, that’s ok. You can use store-bought. You will need about 1/4 cup of jam. If you have leftover jam, keep it in the refrigerator and use it within 1-2 weeks. Spread it on some toast, or my favorite way is to add to a yogurt bowl, with some fresh fruit (and granola sometimes). Que visual incrível!!!!!!! Doce maravilhoso!!!! !